Saw that same blue jay that I spotted on the way to work Friday, and instead of having a Kleenex in its beak, this morning it was drinking from some water in the middle of the road — largely a sign that the worst of the SARS outbreak is over in Toronto. Earthquake rattles part of the South U.S.
Here’s a map of all recent earthquake activity. Much more in the earthquake section of the National page. No storms in the Dallas-Fort Worth area today, but a chance exists through the week. Hit-and-miss showers and storms may rule Tuesday, according to this USA Today article. Want to see an NBC blooper (that’s being featured in a promo running right now) before the blooper show airs Tuesday night at 8 p.m. ET? It involves a co-worker of mine, morning anchor Michael Scott, who told me he’s now being referred to as “lizard boy.” Here’s When Geckos Attack Anchors. The Toronto Blue Jays apparently want to drop the “Blue” part from its name. The Texas Rangers are arriving in Toronto and will be staying in their rooms as SARS has many concerned. This is a true story: On the way to work Friday morning, I saw a blue jay fly up to a branch … with a Kleenex in its beak! I’m not sure if it was upset over the possible Toronto Blue Jays name change, or if it was protecting itself from SARS. As for weather, it was great here in Fort Worth, and I went with my wife and family to the Fort Worth Main Street Arts Festival. It was sunny and the high was 88. Windy also, but I love wind. North Texas and the Plains could see stormy weather beginning Monday afternoon. Further west, it will be wet on the West Coast. More details on Monday’s forecast in this USA Today article. Check your closest city for cams and radars. Saw the Texas Rangers almost beat the NY Yankees last night. We may go see a game again tonight… Looks like the Mavs are well on their way. But enough about sports, this is a mostly weather and webcam site. Parts of Alabama are under tornado warning. Here’s a radar loop and NWS text warnings. More radars and cams in the Birmingham page. A portion of southern Illinois is also in a tornado warning this afternoon. Last night, powerful storms hit just south of Dallas Fort Worth, with 100 mph winds, damaging 50 homes and leaving 100 to 150 homeless. More details here. Severe weather moved across parts of Texas, including Abilene and Dallas-Fort Worth. Ana Strengthens To First Ever April Tropical Storm. Check out the hurricane section in the National page for more. Lyrid Meteor Shower under way, says SpaceWeather.com. It peaks Apr. 22 and 23. A tornado hit northern Oklahoma, damaging 10 to 30 homes. Tornadoes also hit Nebraska. Are webcams turning the world into Big Brother? This article from Ireland’s ElectricNews.net suggests EarthCam.com is among Web sites making it a surveillance nation. Here’s a Detroit News article on how the Failed Iraq Webcam plan still sheds light. Space Station fly-by animated gif is on SpaceWeather.com’s homepage. Good Friday Forecast: Storms move across the U.S. with widespread rain, snow in a some places, and a chance of severe storms with dangerous winds or large hail in the Plains. More details in this USA Today article. SpaceWeather.com has a strange moon shot. How about getting a phone call when auroras light up the sky, or the space station flies by? SpaceWeather has a new alert service that phones you when things are happening in the skies. Why did the lights go out in College Station, Texas? There were some reports that the power outage affected residents as far away as Houston and Dallas! A tornado warning in the Denver area spawned concern this evening. Here’s the story from TheDenverChannel. It’s chilly in the Northeast and Mid-Atlantic today … a cruel turn of events after a warm few days up there. More, including today’s forecast from USA Today. A wintry mix, rain and storms are in the forecast for much of the Midwest today. Here’s a North Central & Midwest US radar loop and lower Midwest radar loop. Check your closest city for many radars and cams. 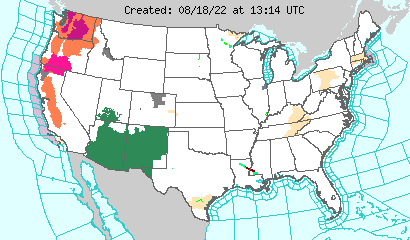 Monitor watches and warnings at Earthwatch and NWS. Some links of note for monitoring storms: Weather.com thunderstorm forecast and Precip forecast. The record warmth for the Midwest ends with the arrival of these storms. A return to winter is in store for many up there. Details on Wednesday’s weather here.